Modulation of Growth Factor Signaling by Gangliosides: Positive Or Negative? In the past decade, there has been an explosion of progress in understanding the roles of carbohydrates in biological systems. This explosive progress was made with the efforts in determining the roles of carbohydrates in immunology, neurobiology and many other disciplines, examining each unique system and employing new technology. 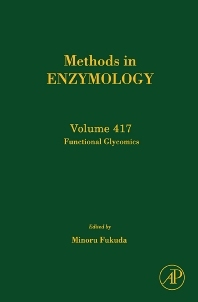 This volume represents the second of three in the Methods in Enzymology series, including Glycobiology (vol. 415) and Glycomics (vol. 416), dedicated to disseminating information on methods in determining the biological roles of carbohydrates. These books are designed to provide an introduction of new methods to a large variety of readers who would like to participate in and contribute to the advancement of glycobiology. The methods covered include structural analysis of carbohydrates, biological and chemical synthesis of carbohydrates, expression and determination of ligands for carbohydrate-binding proteins, gene expression profiling including micro array, and generation of gene knockout mice and their phenotype analyses. Graduate students, researchers in academics and industry studying biochemistry and glycobiology.